Peggy Thurston Farrell studied art education at Carroll College in 1972 and later obtained a Master of Fine Arts from the University of Wisconsin-Milwaukee. Her work has been showcased globally, throughout her career. Her current work has moved towards symbolism and three-dimensional presentations. Between the Layers owes its origins to underground treasures and artifacts, which inspired the production of this work. Hard-edge painting and post-painterly abstraction are two artistic movements, originating in the 1950s and ending in the 1970s, that share similarities to Thurston Farrell’s work. 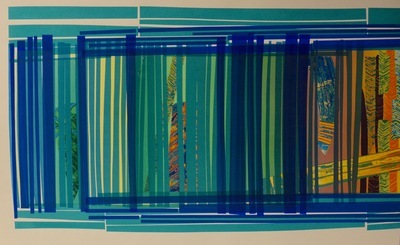 These similarities are a consequence of the temporal relation of her 1981 Between the Layers silkscreen to artwork of the 1980s. Abstract art of that era was largely a combination of earlier abstract movements.